The heat is forcing bugs to take refuge inside homes. "They are looking for food and water, and all of that is available in our homes, so that's where they are heading," said Dustin Adams, Adams Exterminating Services manager. He said this summer's problem bugs are spiders, sugar ants and wasps. "A lot of bugs are desperate for water, like everybody else I guess," exterminator Hector Cristalles said. The extreme heat is pushing many insects indoors. There are ways to avoid an insect invasion. The bug experts said a close examination of your home is step one. Look for easy entry points. One of the pests' favorite places to enter homes is where there is plumbing or electrical wires entering the building, so make sure the holes are tightly sealed. "A lot of people will put steel wool or copper mesh up inside the weep holes," Adams said. "Then, another big thing I see when I go into houses is, homes that don't have good seals around the door." Adams said you may need to spray for bugs more than last year because heat and sunlight quickly break down the chemicals. 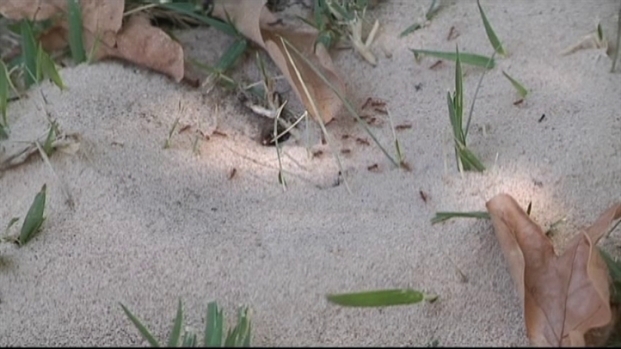 Some insects, such as fire ants and mosquitoes, have not found their way indoors this summer. "Mosquitoes are water-borne insects, so they need water to start their life cycles," outdoor educator Brian Wheeler said.